Oops, I did it again. I’m now most of the way through my travels, and I forgot to examine and document as much as I had planned to. So it goes. We made the most of time in Zürich. We stayed in a really funky hotel in West Zürich, 25hours. 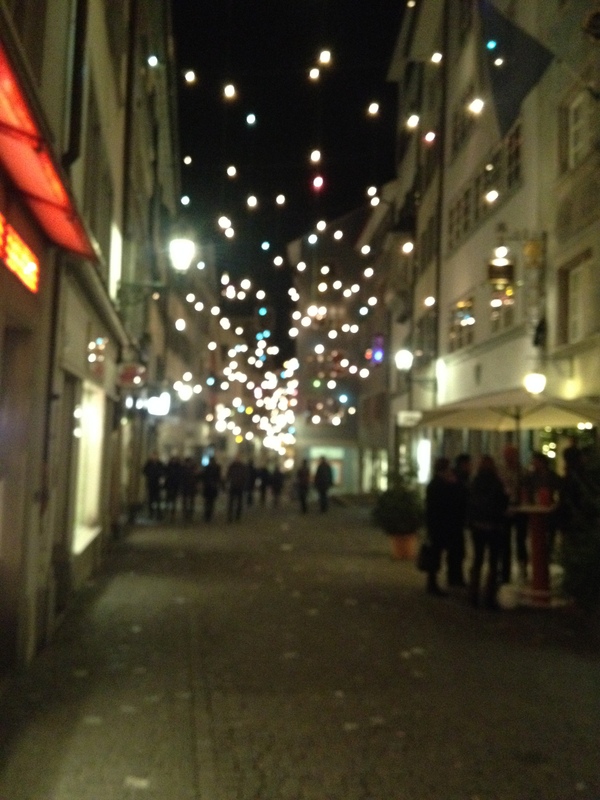 In the evening I dragged myself out of the hotel (jet lag still strong), to go to the Zürich Christmas Market. Zürich is a beautiful and clean city with well-preserved mediaeval buildings in Old Town (Altstadt). We first went to the Christkindlimarkt inside Hauptbahnhof (HB; Zürich’s central train station). Oh, the divine smell of Glühwien and Glühbier, potato raclette, dried apple, pretzels, sausages and gingerbread! The indoor markets at HB featured a huge, natural fir tree, decorated with thousands of glittering crystal ornaments that reflected the light and the bustle of the markets. Stalls were selling gifts made of carved wood, scarves, jewellery, tin toys and fleece hand-puppets. The outdoor Christmas Market was winding down at 11pm when we got there, but Altstadt was lit up with incredible hanging lights that swayed in the breeze like colourful fireflies. 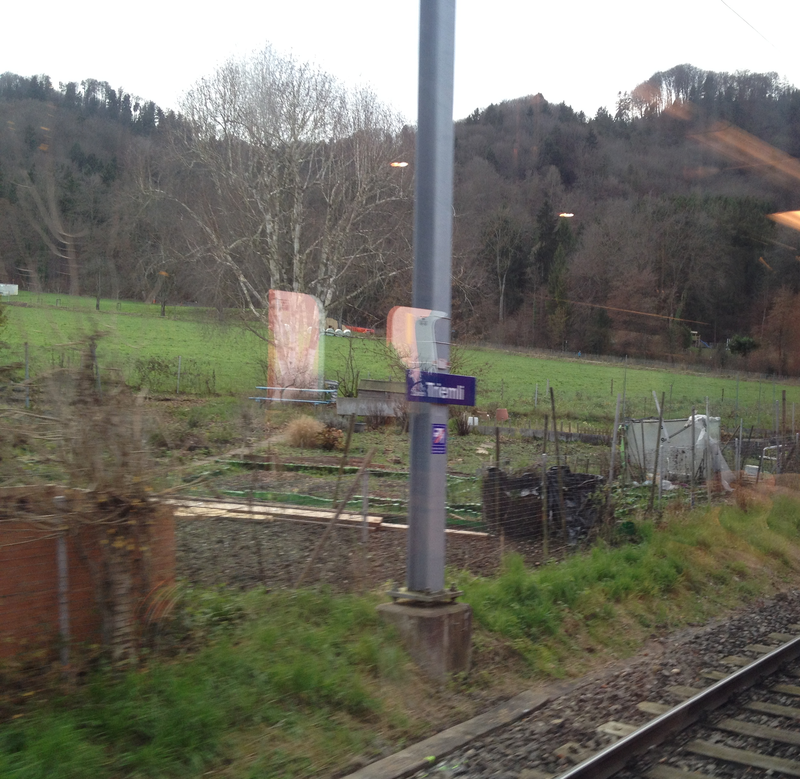 The next day we grabbed a quick pastrami sandwich/ham pretzel and we got on a train to Triemli, at the bottom of Üetliberg Mountain. After a bit of map-wrangling, we were on our way. It was a beautiful ~1h ascent, no cars allowed. Plenty of mountain bikers taking advantage of the great trails and bridges, and also runners (making me miss running). The often-steep ascent was good training for me – I struggle with hills. The view at the top of Üetliberg was incredible, both on Zürich-side, and the other side, which looked lush and green even in winter. (Sadly, not my picture – panorama by Heni2000, via Wikimedia Commons). After enjoying the cool mountain air and the views we caught the train back to Zürich, and very briefly popped into Kunsthaus Art Museum, prior to grabbing lunch at HB and making our way to Zürich airport. The flight to Newark, NJ was turbulent at times, but otherwise uneventful. I watched one and a bit movies (short reviews below). Newark Airport was pretty plain, with minimal decorations (especially coming from Christmassy Europe! ), and quite inefficient at processing arrivals. Some time later, following an airport bus, a hotel shuttle and many standing microsleeps, we reached Spring Hill Apartments, our overnight airport hotel. 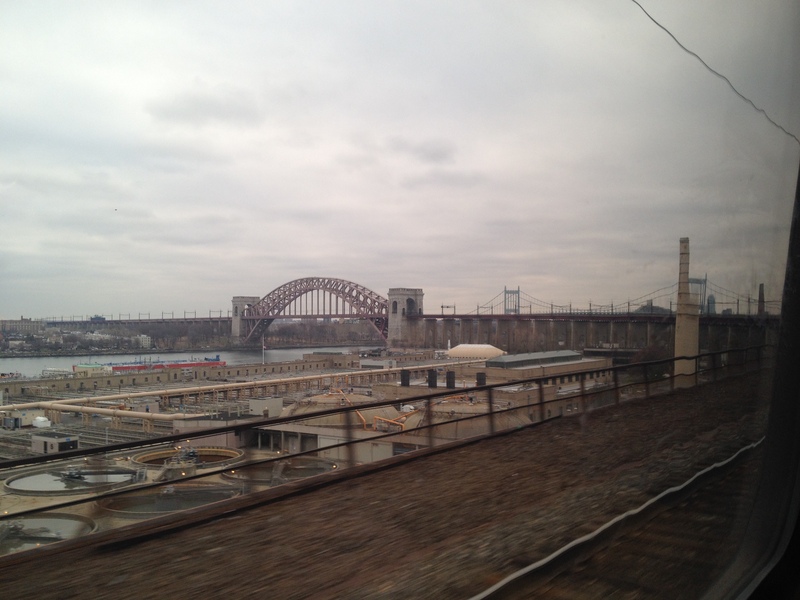 The next morning, following a fairly standard hotel breakfast, and another hotel shuttle and airport train, we finally ended up on the Amtrak between Newark and Boston, which is where the bulk of this entry was written. This was a cool journey, with a tantalising peek of Manhattan, and alternating drab city outskirts and picturesque New England states (Connecticut, Rhode Island, Massachusetts). Five hours later, we reached Boston. Two teens, Hazel and Gus, fall in love after meeting at a cancer support group. Overall this was a sweet movie about the experience of younger people who have cancer/chronic illness, a subject which is not covered often enough. I really liked the day-to-day stuff – life happens around illness. The sadness induced by the theme of the movie was, however, tempered by occasional frustration at the self-centeredness of the main characters, which the movie seemed to indulge. Hector, a British psychiatrist, searches the globe to find the secret of happiness. I wanted to watch this, I really did, but gave up about half an hour in, when dull-as-ditchwater Hector (not redeemed by being played by Simon Pegg, sadly) decided to go to China to discover himself. Pass. When two disastrous events rock Paula’s comfortable suburban life, she decides to run away, taking her children and father on a caravan trip around Australia. This book made me eyeroll quite hard at times, but in the end it subverted some of the expectations it had set up. I found the ending satisfying, but even so, I still found the characters either not believable, or quite unsympathetic. Police inspector Carl Mørck is given lead of a department of cold cases. The first case he becomes involved in is about a missing popular female politician. I enjoyed this book. More Scandi crime, but with an interesting main character, an intriguing assistant who stole the show at times, and a plucky victim. Still not as good as the Rebecca Martinsson books by Asa Larsson, but good enough that I also bought Redemption, the second book in this series. Four paranormal activity seekers arrive at notoriously unfriendly Hill House: Dr. Montague, an occult anthropologist looking for objective evidence of a haunting, and his three assistants. I’ve been saving/avoiding this book until now – it seems perfect to be reading it as I enter New England (Jackson spent most of her life in Vermont). So far, so good – gloomy and foreboding atmosphere, and an interesting main character. I am possibly getting better at flying. The mindfulness stuff I’ve been practicing might be rubbing off on me – carrying on, despite physical or emotional discomfort. The past few weeks have been hard, and I’ve gotten here by putting one foot in front of the other. But here I am, finally on this trip to Europe and the US. Zürich airport is bright and modern and spacious. I’m glad we get to spend a full day in Zürich in a few days’ time, to get to know the city outside the airport a little. We’re now sitting in Marché (a café/hot food place in the airport), having just had delicious pastries and cappuccino. C is industriously writing in his wine-coloured Moleskine, and I’ve decided to make a small commitment to writing myself, and jot a few words down daily about whatever. What we’ve done, what we’re doing. I love being away, on holiday. The start of any holiday is so shiny – time stretches out luxuriously in front of you, heavy with possibilities – but it is always over too quickly. Hopefully by noticing more of the detail, being mindful and present, and writing a little each day, I’ll be able to make it last. As part of this I want to keep track of the books I’m reading and the movies I’m seeing. After my reading drought, where I haven’t been able to settle into many books this year, I’ve now finished 2, almost 3 books on this trip. Madness: A Memoir, by Kate Richards. The author is Australian doctor, who has a psychotic illness and depression. This book was brilliant. Intense and beautiful and sad. It shows that a powerful drive to live can coexist with an earnest wish to die, and that trial and error in terms of treatment can pay off, and that other people can hold on to a sense of hope for you until you’re well again. It also made me think of how distressing the things inside our heads can be – not just the thoughts, voices, impulses themselves, but the very fact that we are having them, and what we think this says about us as people. The book is harrowing at times but I’d definitely recommend it. I couldn’t put it down. More in the Joanne Vik/Adam Stubø series. This book is about the abduction of a fictional US President in Olso. I like books that take me back to a familiar, comfortable universe (Oslo; the protagonists’ family) but this book was quite devoid of suspense and tension for me. 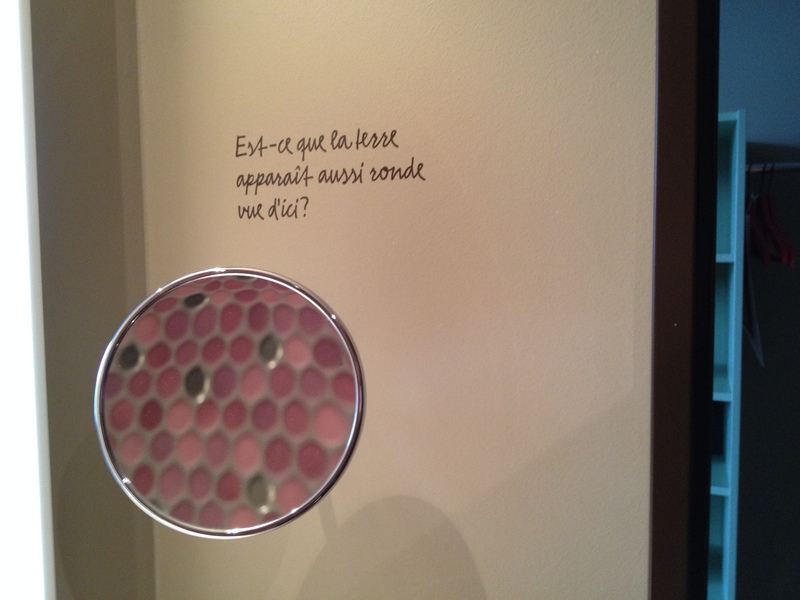 Interesting idea, but I felt quite ‘meh’ about it. I liked the earlier Vik/Stubø books, but I’m not sure if I’ll keep reading the books in this series. Unfinished, as yet. Australian chick-lit drama, kind of. (I know, I know. What was I thinking??) This book isn’t ringing true to me, and I’m finding at least one of the main characters utterly unlikeable. If the ending of the book is true to what is being set up, I think I’m going to throw up a little. It’s interesting to me that in my previous professional life I had much more free time, and I was deeply unhappy, both of which led me to do a lot more art/craft. I was taking photos whenever I could, and actively trying to learn and get better at photography. I was doing graphic design here and there. I actually did two short art courses, which I loved (especially the drawing course). I was sculpting things, and making jewellery. I was writing. Nowadays I am training in a profession that is much more consuming of my time and my interest. It is challenging and I love it and I can’t imagine doing anything else, and I can’t even imagine how I ever thought I would be happy and settled in my prior life. But I don’t have any time for art courses or similar. I don’t even have time to read – I sneak in books in dribs and drabs, here and there. I miss painting and photography and graphic design, and perhaps above all, writing. I guess the point is that you can’t have it all! 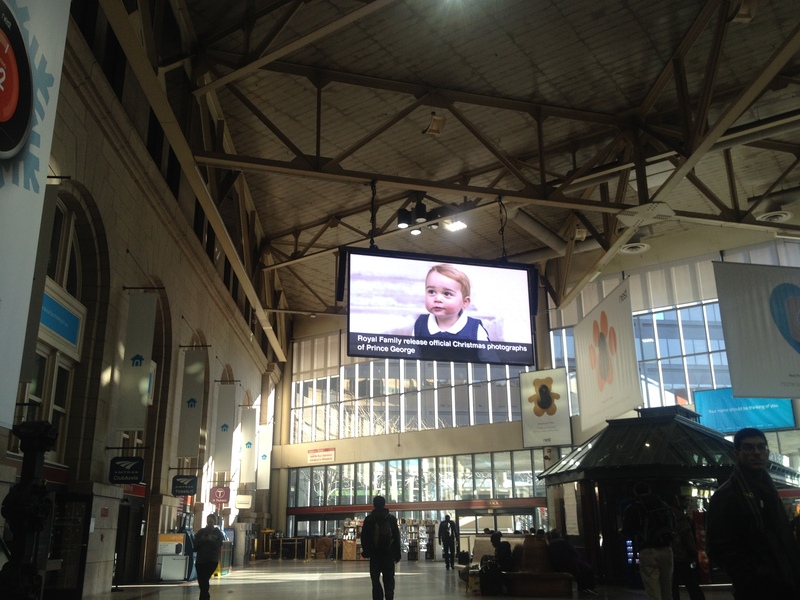 When a door opens, a window closes – and every choice we make eliminates others. This is not a bad thing. I think of it as being similar to synaptic pruning, for the sake of efficiency. I think there comes a point in life when we have to choose a few things to stick with, not necessarily forever, but for a given moment or period of time. Mine at the moment are my loved ones, my training, keeping fit, and gardening (which brings me peace of mind and joy when I do it). What do you think? Can we have it all? What are the things in your life that you’re sticking with for now? Hello, strange blog. It’s been a while. Life has been happening, which means some neglect towards art, craft, interesting culinary creations, and gardening. However, I am slowly getting back into these, and here is some proof. 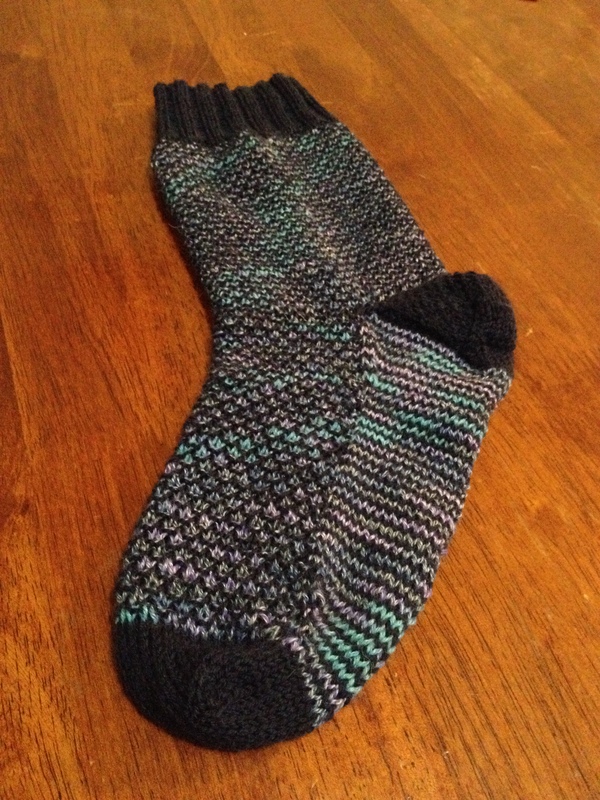 Here is the latest sock creation – this time, for me. It’s an interesting stitch called “broken seed stitch”. The effect you get is that of diamonds on the instep (and stripes on the sole – stocking stitch so that it’s smooth when you step on it), and it works very nicely with one solid and one self-striping or similar yarn. It’s my 8th (I think) pair of socks, and I think I’m starting to get decent at it, although I’d like to try different methods of doing the heel at some point, and more advanced colourwork. 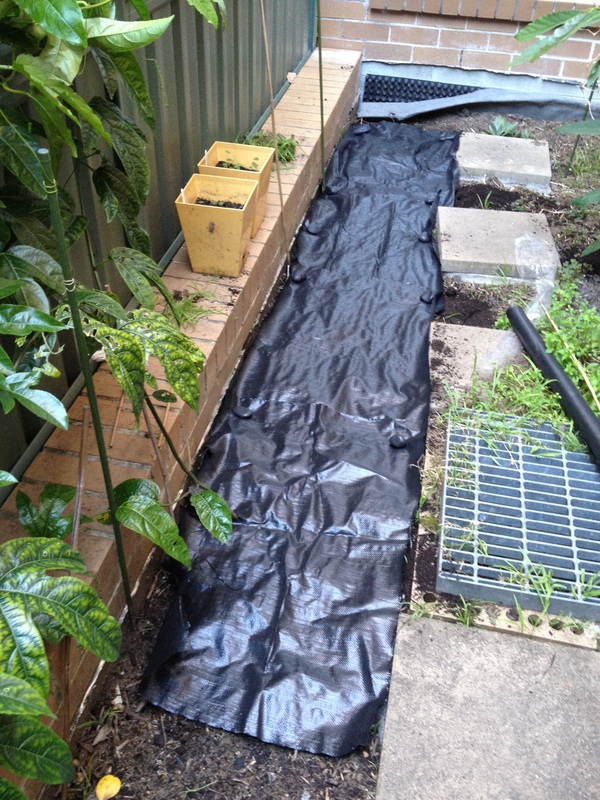 And today I finally put down weed mat in the garden. 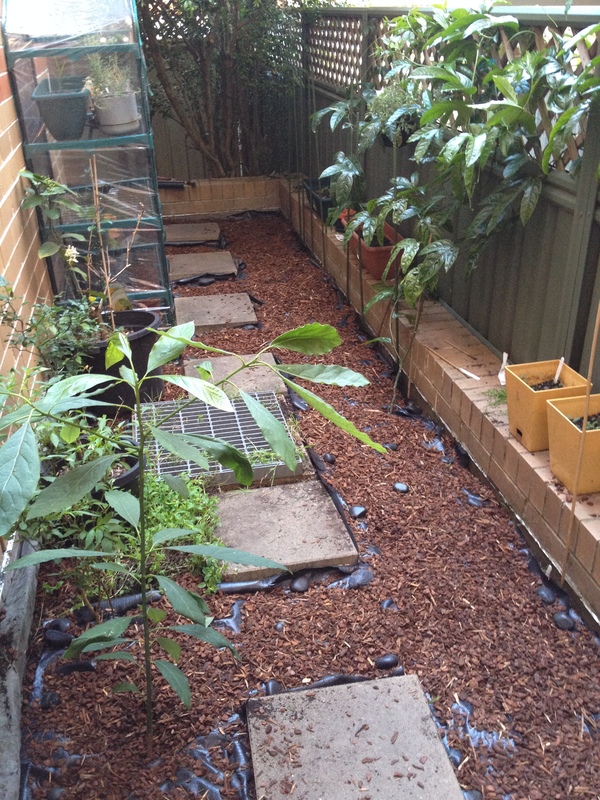 It was pretty easy to do (after weeding – that was the hard part) – I cut pieces to fit the different bits of the garden bed, and held them down with large black river stones, then poured mulch over the top. I hope Ms Kitty doesn’t destroy it, she seemed rather confused by the changes. A couple of months ago I also got a greenhouse (on the left in the second photo), but it doesn’t seem to be doing brilliantly, so the jury’s still out on that addition. 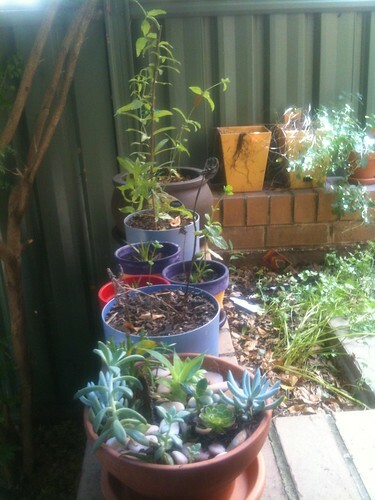 I also somehow ended up with a passionfruit vine, and a tree of unknown origin (avocado?). Today I planted capsicum, chilli, sage, pea, bean, bok choi, red mustard, lettuce, sweet basil, holy basil and coriander seeds in seedling pots, to be transferred to the garden once they’re a bit more hardy. We’ll see what comes up! It’s rainy season. On the bright side, this means that my poor neglected garden gets watered regularly for a change; but also, a proliferation of weeds and snails. 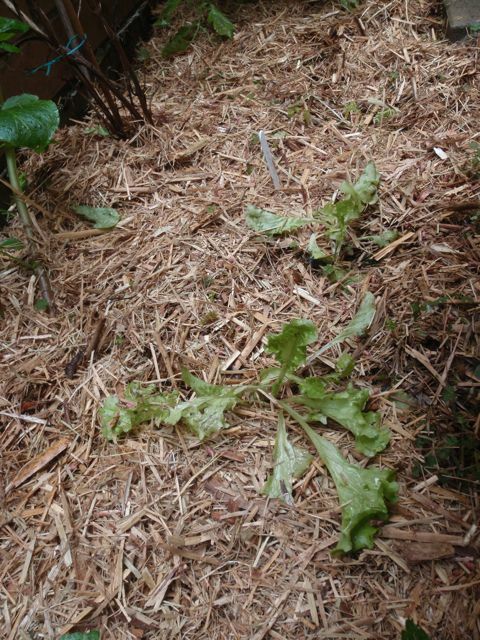 Today I got down to some serious weeding and mulching. 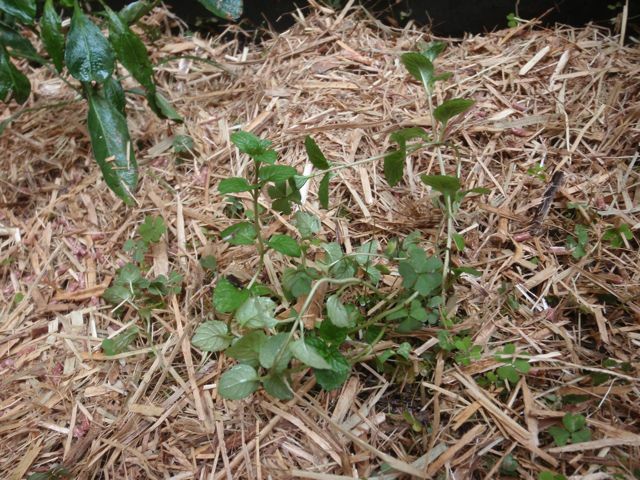 At the moment, instead of lucerne, I’m using organic sweet pea mulch – it smells delicious! 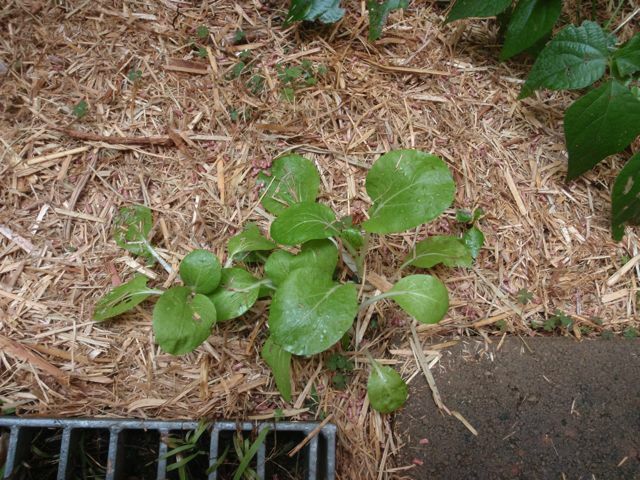 The lemon balm, which started out as an upright little plant, is now spreading horizontally. It has a delightfully lemony flavour which, in cooking, I’ve paired up with pork. 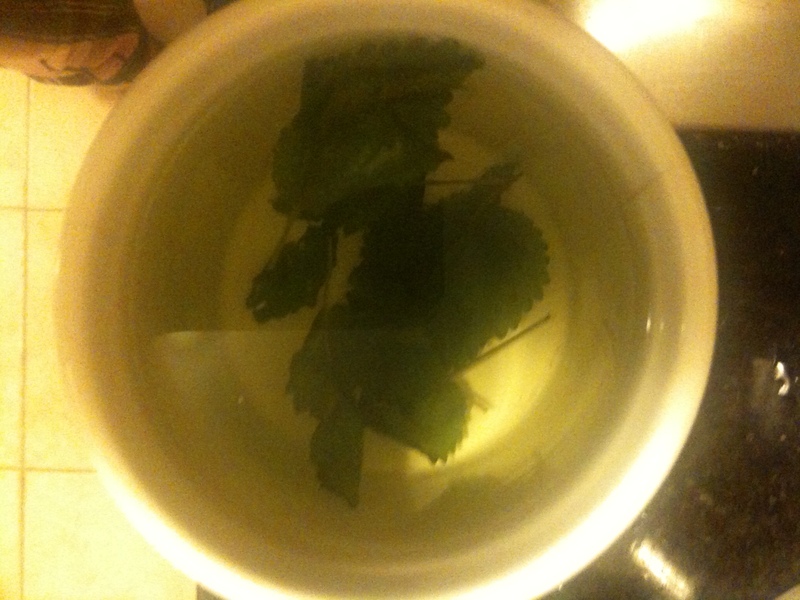 I’ve also pruned it a couple of times, left the leaves to dry for a few weeks, and used them to make a gentle, soothing tisane. 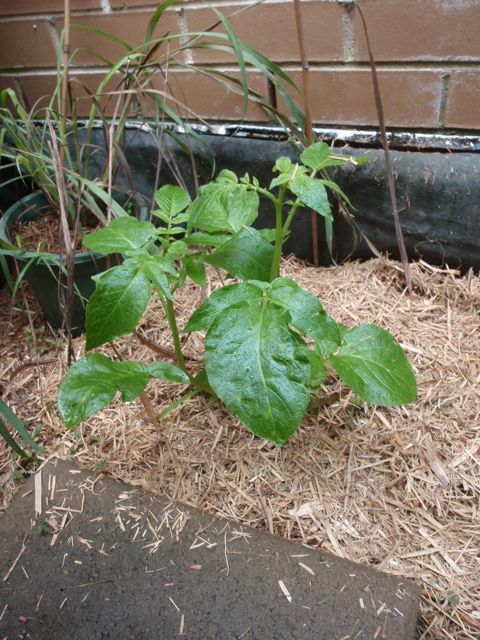 A few weeks ago I planted sprouting potato bits throughout the garden – these are now coming up. I’m not sure how long potatoes take to grow but I’m anticipating tender baby potatoes in the future. The bok choy, from seed, is coming up nicely. 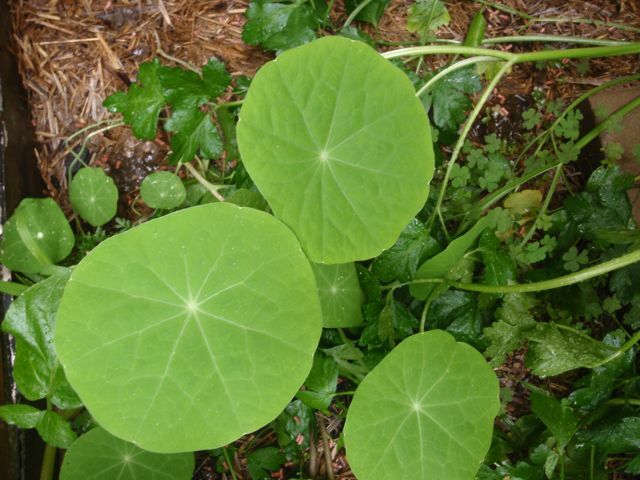 I should be able to use some of the leaves soon, if they don’t get devoured by snails first. AMAZINGLY, some of the mint seeds I planted seem to be doing their thing. Mint seems really difficult to grow in my garden, even though it’s supposed to be almost weed-like, generally. 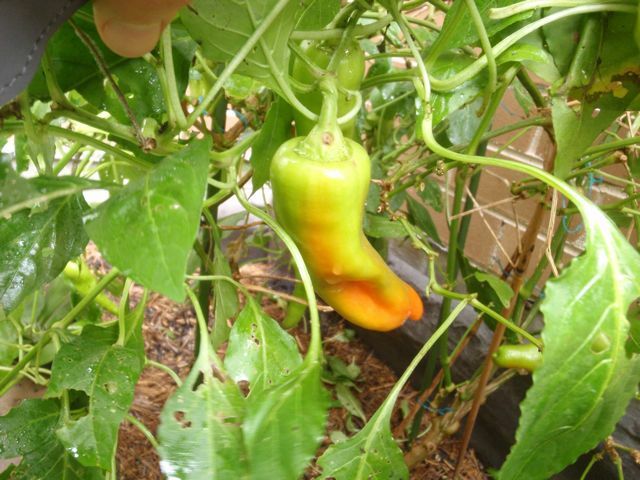 The capsicum plant continues to produce, despite being affected quite badly by snails. 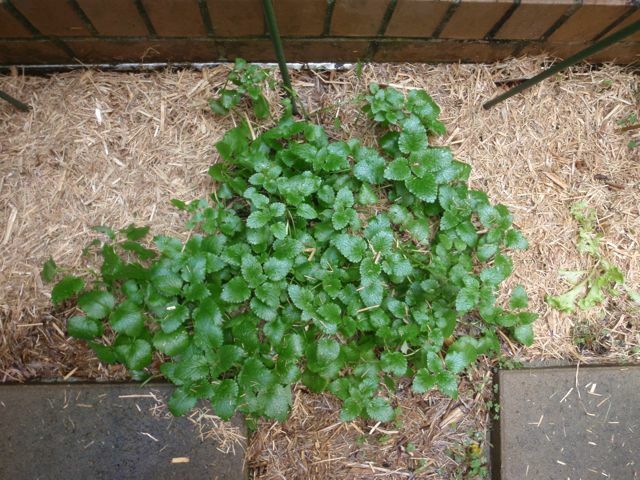 About half of the nasturtiums I planted are doing well, and are quite yummy – they have a peppery, rocket-like bite. The lettuce (again, from seed) is trying, but I’m not sure it’ll make it. 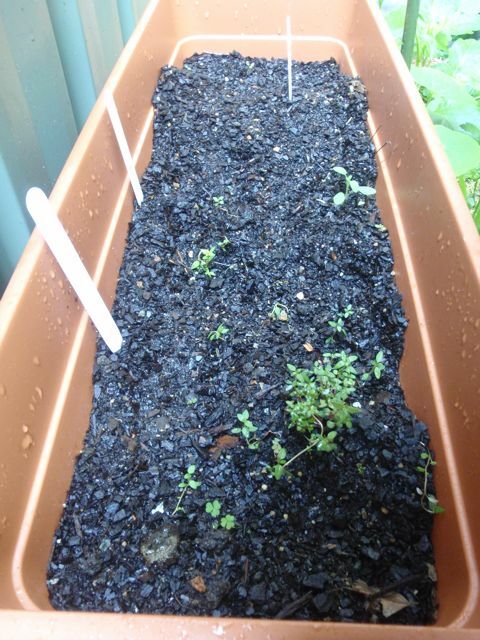 I planted rosemary, sage and thyme in a self-watering container rather than directly in the garden, so I could move the container around as needed. I’ve read that these herbs prefer harsher, dry conditions – the opposite of the weather we’ve been having! Despite this, there’s some thyme and a little sage plant in there. I have high hopes for these little guys (e.g. 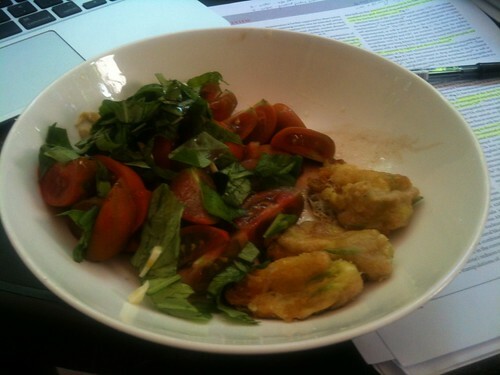 in the form of fried tomatoes with thyme for breakfast). Perfect on a cold, rainy winter day! 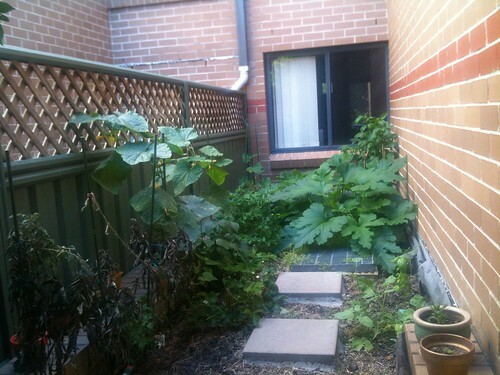 Back when I first decided I wanted to grow my own vegetables, I wanted zucchinis. Lots and lots of them. I adore zucchinis – raw, fried, in sauces, grilled, in cakes, as ‘spaghetti’, you name it. Last summer I planted three zucchini seedlings which took off but then sadly succumbed to powdery mildew. This summer I planted three zucchini seeds, which have resulted in three luxurious plants (perhaps too luxurious, given the size on my garden). These plants are doing well, and have started producing flowers – but no fruit. Research revealed that zucchinis produce both male and female flowers, and often need a hand in pollinating. The problem is that my plants are currently only producing male flowers. I’m hoping that female flowers will eventuate later, and with them, delicious little zucchinis (even if I have to hand-pollinate them myself). In the meantime, since the male flowers serve no current reproductive purpose, I’ve decided to pick them, stuff them, fry them and eat them – and it turns out that fresh zucchini flowers are pretty delicious. Zucchini flowers – removed stamen, stuffed with finely-chopped Swiss cheese, grated parmesan, crushed pine nuts, salt and pepper. Lightly battered in a mixture of flour and mineral water and fried in a standard frying pan with about a tablespoon of olive oil – not deep-fried, as per most recipes. For the stuffing I used what I already had in the house, but here are some other ideas: olive, anchovy and ricotta 1 and 2; ricotta, parmesan, chives and spices; goat curd, chives, semolina; and plenty more here. I’ve completely neglected to mention my garden on this blog, which is remiss of me, especially because gardening can be quite a creative pursuit. 1.5 years ago I moved into an apartment with a little back yard, and a good-sized raised flower bed, which I converted into a herb and vegetable garden one year ago. 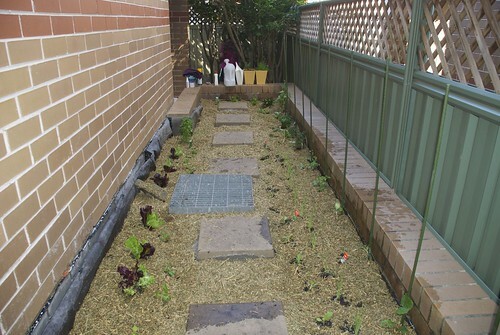 I’ve learned a lot about gardening over the past year; the first lot of vegetable seedlings I planted didn’t fare well – partly because of the heat wave last year, partly because of my inexperience. In the meantime, I’ve been researching, reading, saving seeds, planting seeds, pruning and spraying my way to a healthier and more productive garden. 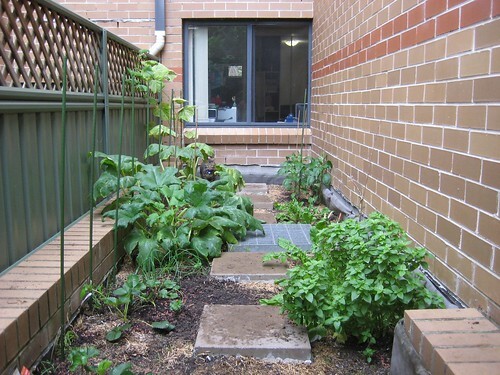 My current garden has its ups and downs, but overall is doing well – so far I’ve had a good supply of green beans, tomatoes, shallots, basil and coriander, with garlic and cucumbers also well on their way. My goal is to be able to cook meals with as many ingredients from my garden as possible, and reduce the amount of vegetables and herbs I buy. 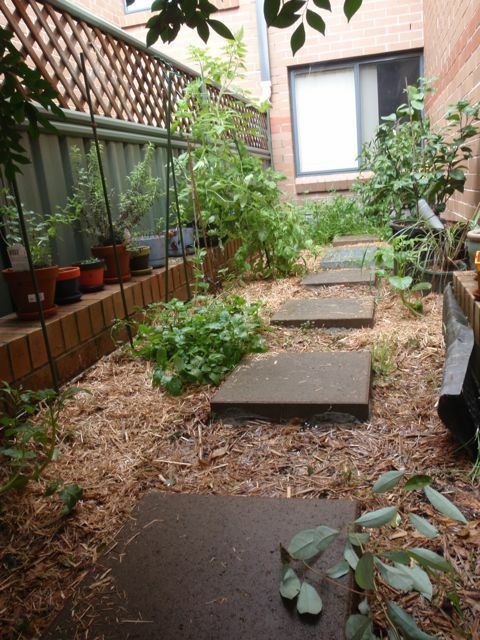 Tomato plants, cucumbers, beans, shallots, basil, capsicum, zucchini, garlic, parsley, radishes, strawberries. Doing much better, although the quality of the photo doesn’t do it justice.